RM Italy has replaced the KL-145 amplifier listing with a LA-145 model that appears externally identical except for color and is rated at 85 watts output for 4 watts input. 1. 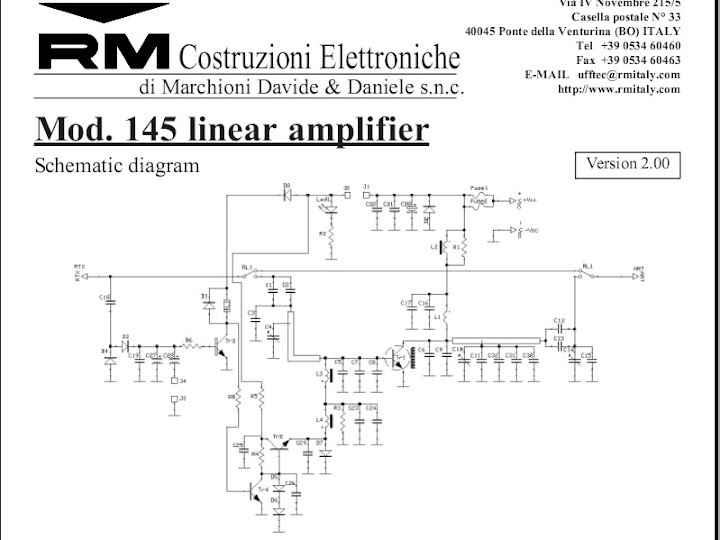 An RM Italy KL-145 Linear Amplifier purchased from DNJ Radio. The manufacturer's specifications rated this unit at 110 watts output for 25 watts input. 5 watts from my Elecraft XV144 transverter drove its SD1477 transistor to 50 watts output. The SD1477 transistor in these KL-145 amplifiers had a frequent failure rate with higher applied RF drive as there is no overdrive protection. RM Italy has replaced the KL-145 listing with a LA-145 model that appears externally identical except for color and is rated at 85 watts output for 4 watts input. 2. On 18 June 2012 I put this unit into service at 50 watts output power on WSPR, a digital mode running 20% duty cycle, 2 minutes on, 8 minutes off. On 30 June, the amplifier failed and developed a zero ohm short circuit as measured across its power cord. The RM Italy technical support staff promptly responded to my inquiry, advising that the failure may have been caused by excessive temperature as the fixed idling current decreases amplifier efficiency at lower output power levels. 3. Here is a replacement RM Italy KL-145 Linear Amplifier under test with a SilenX Effizio EFX-10-12 fan on the heat sink. The amplifier is being driven to to 55 watts into a 50 ohm non-reactive load and the DC voltage and current are being monitored with a Turnigy 130A watt meter. DC power consumption is 108 watts and the efficiency is approximately 50%, normal for a linear amplifier. A temperature probe was placed on the warmest part of the heat sink to monitor heating during operation. 4. The RM Italy KL-145 amplifier temperature test during WSPR operation. 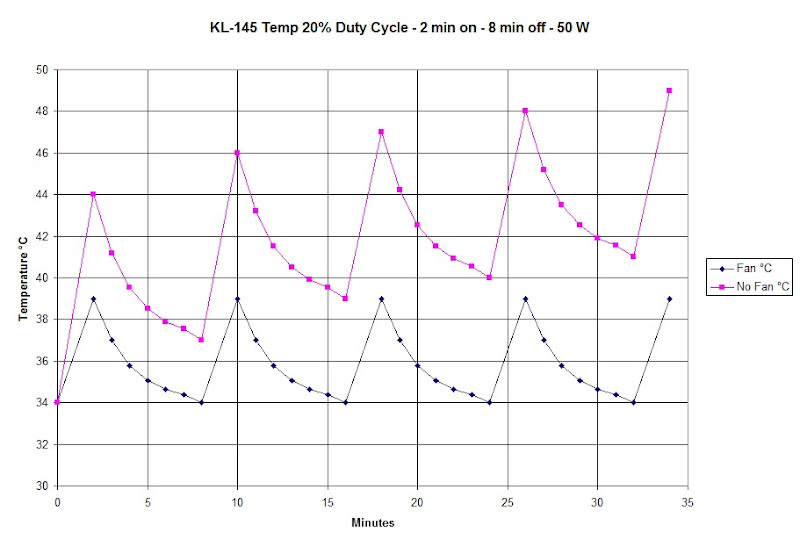 Without fan cooling, successive transmission cycles at this duty cycle had caused cumulative temperature rise eventually causing amplifier failure. With the SilenX EFX-10-12 fan on the heat sink, the amplifier's temperature never exceeded 39°C and has been in constant operation since July 2012. 6. Here are two WaveNode UHF-1 RF sensor units, one attached to the input and the other attached to the output of the RM Italy KL-145 linear amplifier. The top cover of the Elecraft XV144 transverter is seen in the foreground. A Waters model 336 coaxial transfer switch is behind the sensor units. 7. 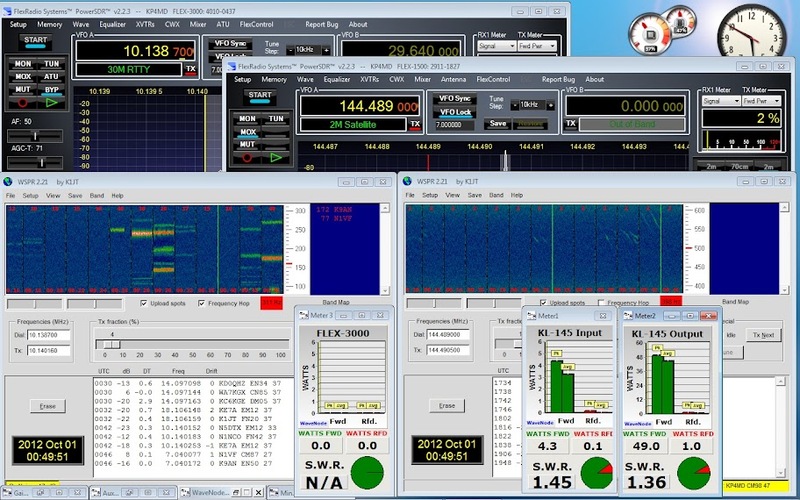 PowerSDR running on a FLEX-3000 and a FLEX-1500 with 2 meter transverter, with instances of WSPR for HF and VHF. The WaveNode WN-2 monitors the input power to the RM Italy KL-145 linear amplifier and power output of both transmitters. 8. 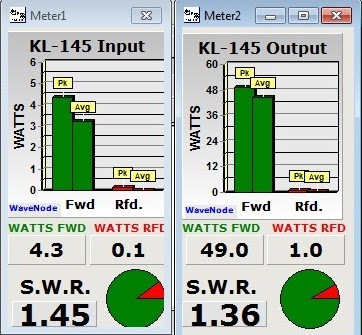 The WaveNode WN-2 produced this power vs. gain performance graph for the RM Italy KL-145 amplifier, showing nearly constant gain measured at 11-12 dB from 25 to 100 watts output. Above this level the gain decreases to 8 dB at 150 watts output. This behavior is normal for solid state linear amplifiers. 9. 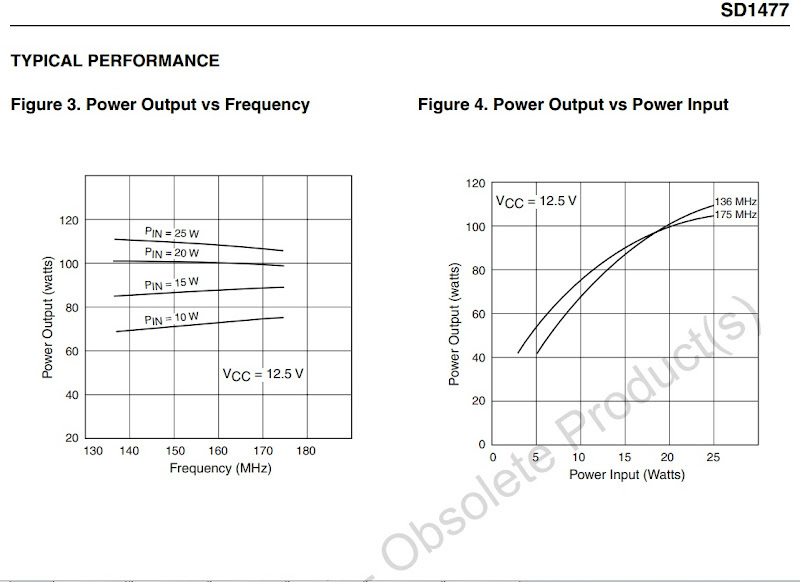 For comparison, here is a power vs. gain performance graph for the $369 Mirage B-2518-G linear amplifier, also showing similar gain measured at 11-12 dB from 25 to 100 watts output. Above this level the gain decreases to 10 dB at 120 watts output. 10. Here the WaveNode displays simultaneous input and output measurements of the RM Italy KL-145 linear amplifier. 11. The internal view of the RM Italy KL-145 linear amplifier showing clean, solid construction and excellent workmanship. 12. A close-up view showing the SD1477 transistor in the RM Italy KL-145 linear amplifier. 13. 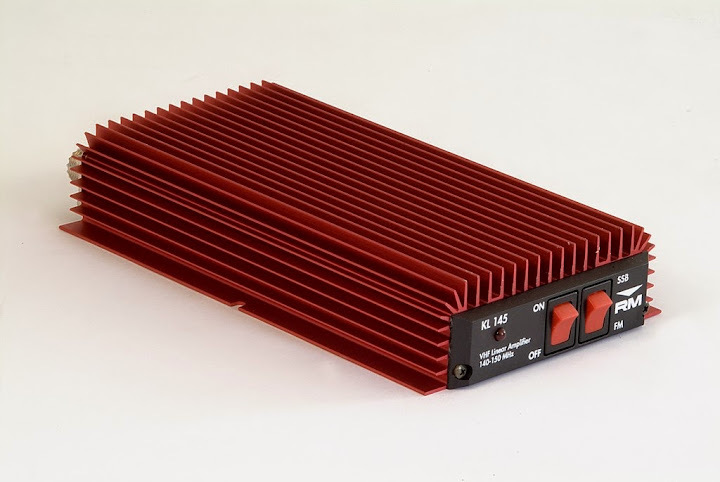 The measured performance of the RM Italy KL-145 amplifier approximates the manufacturer's specifications for its SD1477 transistor. 14. As the RM Italy KL-145 linear amplifier's circuit is a basic, straightforward design, similar to the PA10-80BL amplifier formerly made by KLM Electronics, the user must take precautions to avoid excess drive power, SWR and operating temperature. 15. The RM Italy KL-145 amplifier performed dependably at 50 watts output on WSPR mode since July 2012. With the supplemental cooling fan there was little perceptible heating of the amplifier during digital mode transmissions. For typical use, the KL-145 from DNJ Radio at $130 is an economical alternative to similar VHF amplifiers in this power range.